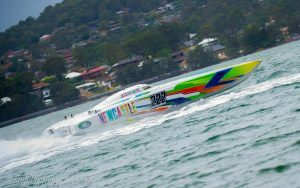 The waters of Hervey Bay last weekend were not what was expected, flatter than anyone could remember for this event. 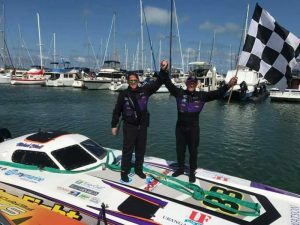 With point very tight for both classes and the outright “Aus 1” crown race 1 took to the waters of Hervey Bay. 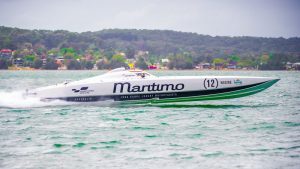 Supercat Extreme battle between”Maritimo” and “222 Offshore” was on but on lap 3 “222 Offshore” slowed and was requiring a tow back to the pit, “Maritimo 11”, Ross and Andrew Willaton had the new “R36 Maritimo” fling with team mates “Maritimo 12” Tom Barry Cotter and Steve Jellick chasing and “KKR Transport in the hunt, this is how they stayed to the chequer flag. “Hogs Breath Team Hulk” takes the win followed by”Saracen” and “Phantom”. 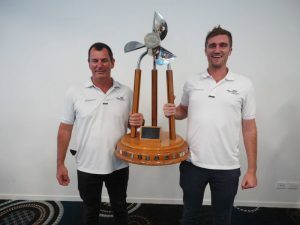 Between races information came back that “222 offshore” had broken a driveshaft and lost the prop and managed to replace the shaft and prop between the races and make it out for race 2. The water had chopped up a lot more since race 1 but nothing on previous races at Hervey Bay. 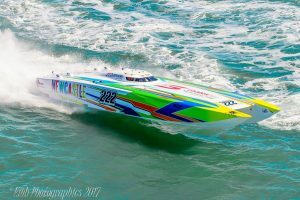 Supercat Extreme “Maritimo 11” jumped out of the box until lap 6 when they pulled out with an engine issue leaving “Maritimo 12”, “222 Offshore “and “KKR Transport” battling for points and this is how they crossed the line and with 2nd place points “222 Offshore” win the 2018 Supercat Extreme Championship and the ‘AUS 1’ title. The lead changed every lap until “Hogs Breath Team Hulk” seemed to lose power and feel back in the field, “Saracen” had a moment at the western turn riding onto its side and nearly rolling, Matt Kelly the driver said ‘All I could see was green, thought we were over for sure’, They managed to stay in front to take the win from “Hogs Breath Team Hulk”, “Eighty Eight Powerzone” and “Phantom”, also with taking 2nd “Hogs Breath Team Hulk” win the 2018 Supercat Outboard Championship. Thank you to all the public support to the event the teams really enjoy talking to you all. 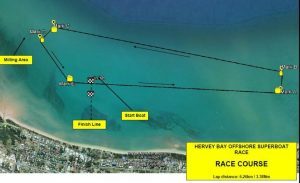 Thank you to Wide Bay Cranes, Beach House Hotel, Handy Hire, Fraser Coast Events, Hervey Bay City Council, Hervey Bay Boat Club and of course our great race organisers and all of the volunteers that help make this happen. Supercat Outboard; Hogs Breath Team Hulk, Mick Walker and Paul Fowlds (with Ian Harris). We now look forward to 2019 in which we look forward to more boats on the water and maybe some new locations. 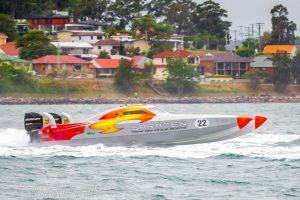 The Lace Macquarie community had 3 fantastic races over the weekend, With dark skies, rain and wind crowds lined the foreshore to watch some great battles. 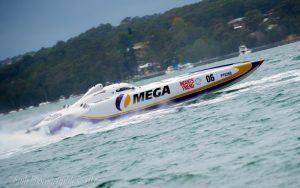 The lake had so much going on over the weekend, Food and wine festival, Show and Shine car show, Markets, Jet ski racing, display from Formula Futures and the The great Australian Poker Run for MS.
Supercat Extreme having 5 boats racing,” 222 Offshore”, Darren Nicholson and Peter McGrath, “Team Australia”, Brett Luhrmann and Karl Wall, “Maritimo 12”, Tom Barry-Cotter and Steve Jellick, “Maritimo 11”, Ross Willaton and Andrew Willaton and “KKR Transport” ,Ken Tree and Travis Thompson. Race 1,1st, Maritimo 11, 2nd, 222 Offshore, 3rd, Team Australia. 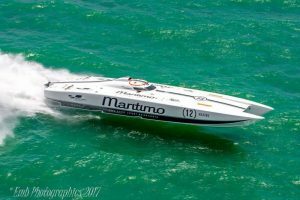 Race 2, Maritimo 12, 2nd, 222 Offshore, 3rd, Maritimo 11. 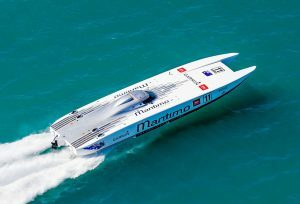 Race 3, Maritimo 11, 2nd, Team Australia, 3rd, KKR Transport. 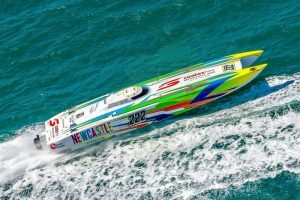 Supercat Outboard also with 5 boats racing, “Eighty Eight Powerzone”, Micheal Ethell and Gryff Ethell, “TCR Offshore” Scott Richardson and Steve Kelly, “SUV Simrad”, Conn Saloumidis and Taelah Saloumidis, “Hogs Breath Team Hulk” Mick Walker and Paul Fowlds and “Saracen”, Antony DeFina and Matt Kelly. 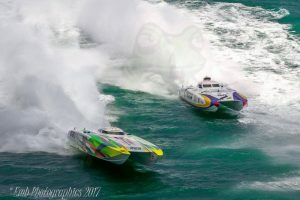 Race 1, TCR Offshore, 2nd, Eighty Eight Powerzone, 3rd, Hogs Breath Team Hulk. 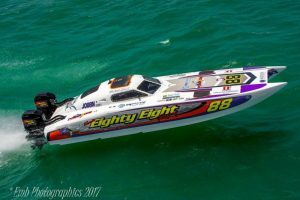 Race 2, Hogs Breath Team Hulk, 2nd, Eighty Eight Powerzone, 3rd, Saracen. 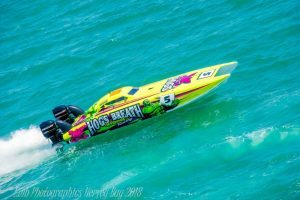 Race 3, Hogs Breath Team Hulk, 2nd, Eighty Eight Powerzone, 3rd, Saracen. 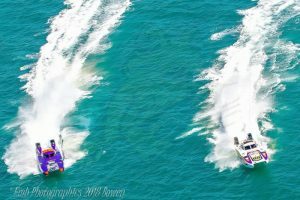 A great weekend of racing with close racing in both classes. 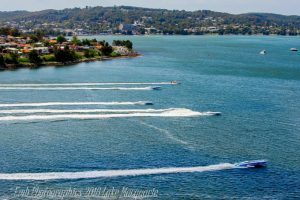 and the community of the Lake Macquarie Area. 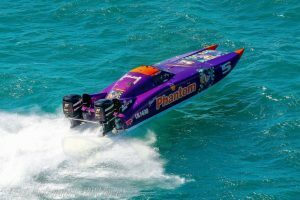 The Offshore Superboat Championships are sad to announce the cancellation of the Coffs Harbour Round due to a lack of boats able to attend. 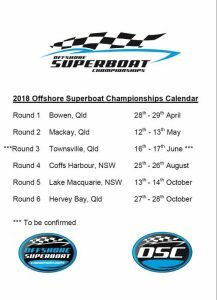 The lack of boats has occurred due to teams competing in overseas competitions and being repaired from previous damage, this has culminated in not having a large enough field to properly put on a great show for Coffs Harbour, so we have decided to regroup for 2018 and come back with a bigger and better show for 2019 . We would like to thank our sponsors and supporters of this event – the NSW Government via Destination NSW, Member for Coffs Harbour Andrew Fraser, Coffs Harbour City Council, Coffs Harbour International Marina, CEX Group, North coast Cranes, Maritime Services and all the wonderful people of Coffs Harbour. We will be back in 2019 and look forward to putting on a great show for all . 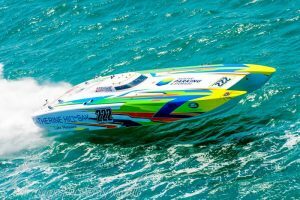 To catch up on TV show of Hervey Bay 2017 use the link below to Motorsportstv.com.au. 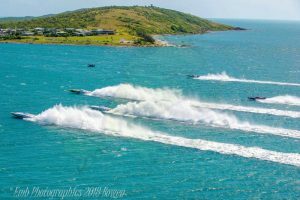 Saturdays Pole Position Shootout had the smoothest water conditions that an competitor could remember. Sunday race day the conditions had turned to what race competitors had come to expect at Hervey Bay with short sharp chop that can stand up and send the boats off into any direction. 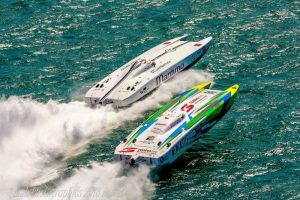 With both Supercat Extreme and Supercat Outboard championships up for grabs some teams had to think about both races and the point required to win a championship. Race 1, Supercat Extreme, Maritimo Australia(Tom Barry-Cotter and Steve Jellick) shoot out of the gate with Mega Fuels (Chris and Brendan Frier), 222 Offshore (Darren Nicholson and Peter McGrath) and Maritimo Racing (Ross and Andrew Willaton), Team 3 did not take the start with a trim issue, with hi flying racing 222 Offshore moved up on Mega Fuels and then Maritimo Australia to take the lead, Mega Fuels also passing Maritimo Australia in to second, 222 Offshore taking the win by only 3 seconds over MegaFuels, Maritimo Australia coming 3rd followed by Maritimo Racing. Supercat Outboard, Saracen (Matt and Steve Kelly) took the lead from Hogs Breath (Chris Haeger and Paul Fowlds), Phantom (Mick Walker and Ian Harris)and Team 88 Powerzone (Michael and Gryff Ethell), 20 minutes into the race Hogs Breath pull into the middle of the course with a propeller issue, Saracen taking the win from Phantom and Team 88 Powerzone. Race 2, Supercat Extreme Team 3 (Travis Thompson and John Shand) were back on course ready to go, once again Maritimo Australia took the lead over Mega Fuels, 222 Offshore, Maritimo Racing and Team 3, at the end of the front straight Maritimo Racing pulled of the course with a mechanical issue, once again 222 Offshore and Mega Fuels moved passed Maritimo Australia and Team 3 in 4th, this is how they stayed for the race with less than a minute between 1st and 3rd. 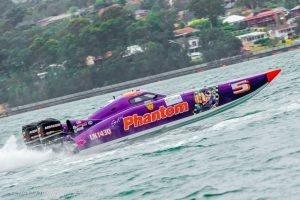 Supercat Outboard, Hogs Breath took the lead from Saracen, Phantom and Team 88 Powerzone and that’s how it stayed for the race, with Phantom and Team 88 Powerzone both knowing they needing to get finish points for their championship race, played safe to finish. A Huge thank you to the town of Hervey Bay for being a great host to the final round and the support from the locals. 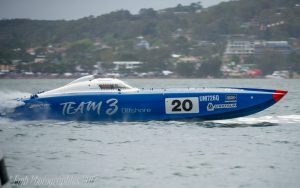 Supercat Extreme Team “Maritimo Australia 12” (Tom Barry-Cotter and Steve Jellick) lead the point race but “Mega Fuels” (Chris and Brendan Frier) and “222 Offshore” (Darren Nicholson and Peter McGrath) have a mathmatical chance of getting the championship points, also in the mix are “Maritimo Racing ! !”(Ross and Andrew Willaton) and “Team 3” (Travis Thompson and John Shand). 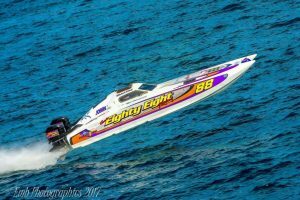 Supercat Outboard race is between “Team 88 Powerzone” (Gryff and Michael Ethell) and “Phantom” (Mick Walker and Ian Harris), also to get in the mix are “Saracen” (Steve and Matt Kelly) and “Hogs Breath” (Chris Heager and Paul Fowlds. Saturday: Pole Position Shootout 12 noon to 1pm. Saturday Afternoon from 3:30pm Street Parade of Boats Through the streets of Hervey Bay (parade map attached). Sunday: Race 1, 11am 30 minute race. 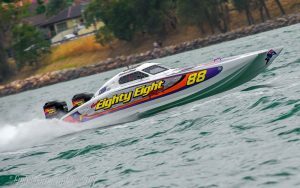 Round 4 at Lake Macquarie was an outstanding weekend with large crowds watching the close racing all around the lake. For the first time there were 3 races over the weekend with the Saturday pole position shootout being replaced with a race. And all of the volunteers that gave their time to make the event happen.